Good evening from Tetouan, Morocco! We have reasonably good wifi for the first time since we arrived, so this will be a photo-heavy update. Enjoy! Today has been packed with activity from the moment we began. A group of early risers even hit the beach in Assilah before breakfast. After breakfast, we visited the Hassan II Center and made connections between the history we have been discussing and modern art. We took some time to stroll and shop in the old medina of Assilah before boarding the bus for the trip to our next destination, Tetouan. Just outside of Tetouan, we had an incredible lunch––plate after beautiful plate––at a hotel restaurant in the hills with a view of the Mediterranean. As soon as we arrived in the city of Tetouan, we walked to the American Language Center, where we participated in an exchange with about fifteen Moroccan students who are studying English there. NMH students spent an hour or so in conversations with Moroccan students, warming up quickly and kindling new friendships. Professor Judith Anderson, who is accompanying us on our trip, gave a stirring presentation to the whole combined group about gender, migration, and diaspora. Several of our new friends then joined us for dinner––with more of the festive Gnawa music and dancing we experienced last night. By the time we got back to our hotel, we were thoroughly tired out. Thank goodness we get to sleep in a little tomorrow! Reflections from Eliza Atwood, Annika Vorheis, and Caleb Little-Poole follow. After waking up and swimming at the beach early this morning, we all grouped up and went to the marketplace in the old medina of Assilah. We had time to walk about, bargain with the vendors, and buy things. The second we came about a “shop,” I was excited and ready to buy the first bag that I saw. I was advised to wait and look through some of the others first, which was a smart idea. The next few shops we walked past all had the same sort of things, but for different prices. I picked up a woven bag with ornate embroidery and vibrant pom-poms and decided that it screamed my sister’s name. It only cost 30 dirhams, which is about three U.S. dollars, so naturally, I got excited. Before I knew it, I had bought three more small bags, a pair of pants, and a pair of fake Ray-Bans. I am excited to bring these home and give them as gifts to my family and friends, but I was equally excited by the process of purchasing them. When I expressed interest in the pair of grey palazzo pants, the vendor told me 150 dirhams. I then looked through my money bag and told him I might return later. He immediately grabbed me and knocked 50 dirhams off the price. Even though I fully expect that these pants might fall apart after one wear, I am still satisfied and happy with the experience. We then kept on walking, observing the colorful shops and murals and interacting with the people on the streets. We hopped on a bus today and left Assilah for Tetouan. 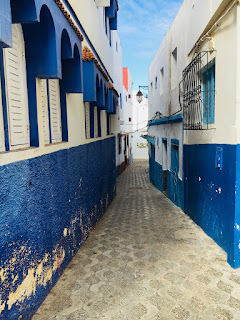 When we arrived at lunch, we walked down a long, steep path and through rosemary bushes before climbing up a tiled staircase and taking our seats at the long table. We were immediately greeted with large baskets of Moroccan-style bread, which is always exciting and delicious. There were a variety of appetizers served, such as fish and chicken dishes (and even eel!). As a vegan, I was served gazpacho. It was so good and refreshing! I got to put different vegetables into the soup and dip my bread. Over lunch, we played a table game that Eliza taught us, which ended up occupying a majority of the long meal. After a few rounds, the main dishes of rice, chicken, and fish came out. My experience with this part of the meal was just mouthwatering. I don’t know how they made the food taste so good, but I’m glad they did! For dessert, I got a cup of fruit (bananas, pears, and apples) soaked in orange juice. I ate it very quickly. All of us were stuffed at this point, but more desserts kept coming out. I felt bad that we were wasting a lot of the food that we couldn’t eat. This is when one of our trip leaders, Patricia, informed us that the extra food that isn’t touched goes to people in the neighborhood who aren’t paid very well: the gardeners at the restaurant and other workers in the area who don’t have much money for food and are extremely grateful. This made me feel better about not eating all the food presented to me. I still, however, think it is important to try all of the foods that are new to me so I can expand my knowledge of food around the world. This evening we attended the American Language Center to meet Moroccan students who are learning English. We asked them questions about their lives and they asked us about ours. One thing I learned about Moroccan culture is that soccer is really the only sport in the country. In addition, I learned that many Moroccans were against Trump in the 2016 election. A common theme I got from the university students is their desire to leave Morocco. 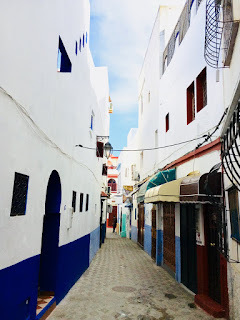 After some questioning, I realized that they did not want to leave Morocco because they did not like it, but to be able to have new experiences in life. After we finished the exchange, we walked to dinner. 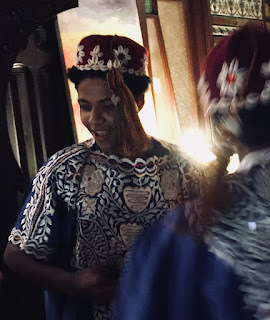 We were welcomed with karkaba and the “African guitar.” There were many points at which my classmates and I engaged with the group, whether it was singing, dancing, or playing the instruments. It was one of our most eventful nights so far: an exchange, a presentation from Judy, and a whole show during dinner. So great to hear and SEE what you've been up to--thank you Meg, Eliza, Annika, and Caleb! Congrats on jumping right in (to the ocean, mixing with students, trying new foods/drinks, into the market). How is your Arabic and French serving you?? Hello to all from Gill on a dark and cloudy day. Wonderful to see all the kids looking so happy and soaking up the exotic culture. As for all that great food, I'll bet that a significant factor in its quality is the absence of processed ingredients, everything sourced locally, fresh daily.